Today most of our devices such as computers, laptops, and smartphones have found various uses for people. The technology that was designed to make job easier have gradually entered the entertainment sector. There’s much music, audio, game, and video devices available for amusement and education. The design of these devices is now improved to the utmost viewing clarity. However, these technologies need external support, especially for speakers. Most of the speakers are good but built with wires and cords that are hazardous. Well, the availability of Bluetooth speakers that offers superb audio quality without the hassle of wires and cables is a premium choice. There are numerous types of wireless speakers now available online, but out of all presented options, the Anker Ultra-Portable Bluetooth speaker makes a good pick. This Bluetooth speaker has many benefits, and it comes with an amazing specs and features. Here you’ll find all the essential characteristics of this new speaker itemized for your information. Do a hands-on on the features on this amazing wireless speaker. Full, High-Definition Sound: Enjoy an extraordinary audio quality through its passive subwoofer and 3W audio driver. The high definition sound also makes it more balanced and clear. Now, users can enjoy excellent sound outside without the hassle of wires. Fast Recharge, Long Playtime: Enjoy longer hours of music, 12 hours at 80% volume, up to 3 times longer than other similar portable speakers. The Bluetooth speaker is rechargeable and gets a full charge in just 3 hours using the micro-USB cable provided. Extremely Compact: This box-sized wireless speaker fits effortlessly into your pocket, jacket, pouch or side pocket of your backpack (45mm / 1.8in, 90g / 3.2oz). 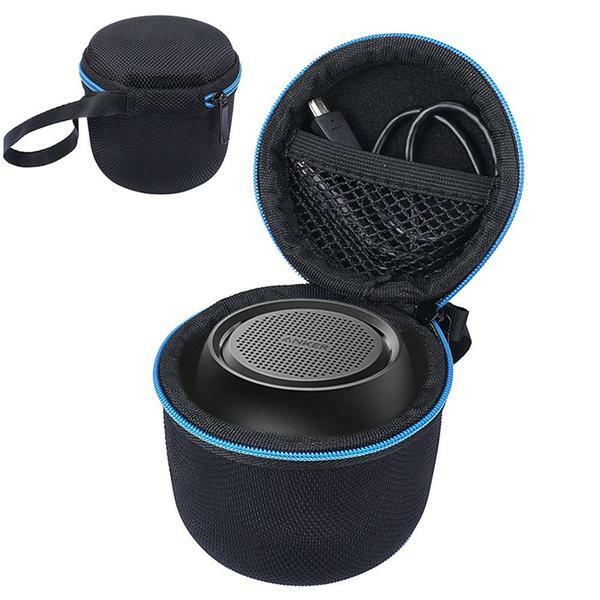 The speaker is convenient for long travels and outdoor activities such as trekking, climbing, camping, and other adventures. Complete Compatibility: Easily pairs with compatible tablets, smartphones, laptops and more via Bluetooth or NFC (up to 10 meters / 33 feet). It can pair with non-Bluetooth devices such as MP3 players using an AUX cable. the Anker Pocket Bluetooth speakers include a 2.3ft Micro-USB charging cable, user guide, 3ft AUX to micro USB audio cable, and an 18-month warranty card. The features mentioned above can help you get the best wireless speakers to improve your audio and video experience. The speaker can connect to multiple Bluetooth enabled devices at a time. It has a lightweight and compact design. It has 12 hours battery life which is incredible. 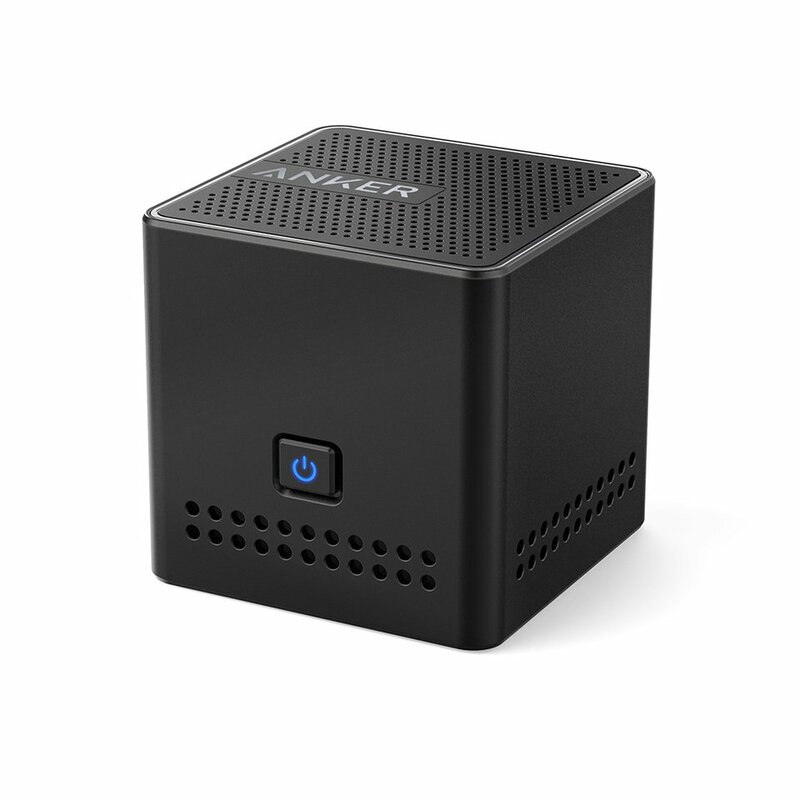 The Anker Classic Portable is a 3-inch cube speaker that comes in white, blue and black colors. It may be in a little package, but it’s overflowing with amazing features and performance. You can see the speaker grill on the top panel. The LED status light in the center is visible at the top and front panel. Its front panel houses three buttons. The + and – buttons let you control the volume and skip tracks. Its center button is for pause/play. You can find the power switch, charging and AUX input on the right panel. Get calls while listening music through your phone. Got some calls while streaming music wirelessly through your phone? Not a big deal! It has a built-in 2-foot range microphone. You can answer phone calls conveniently. When the call ends, the music continues to play. Anker Classic Portable is an affordable wireless speaker that gives you way beyond than just excellent sound quality. It’ll offer a productive battery life that allows you to bring it anywhere without worries. So how does the Anker Classic Portable sound? For a small speaker, it produces a high-definition sound. The volume is sufficient enough to be heard in the room. With a 4-watt, 2-inch speaker driver complemented with bass port, get ready for some booming music experience without bargaining clarity. That’s something you don’t usually get from speakers of its size. Use it wired or unwired, no problem. The company has armed the Anker Classic Portable with a new Bluetooth 4.0 technology that pairs with any Bluetooth-enabled device. Just simply switch the speaker on, it’ll find an audio source with a Bluetooth on. The connection distance range is 33 feet. Have an audio source without Bluetooth? There’s an AUX port where you can plug the 3.5mm audio cable included in the box. Are you ready for more? The built-in rechargeable battery can beat with your music choice for an unmatched 15 to 20 hours of playback time. 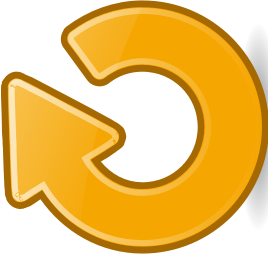 The longevity of the battery will get you into the groove for nearly one day. Color me impressed, but if you aren’t, I’ll give you another catch for this wireless speaker. It costs less than $50! You can finally move into the beat without spending much. The Anker Classic Portable has been my music buddy for five months. Ever since I had it, I had no issues with it. It stayed true to the advertised 20 hours of battery life. The loud audio is clear and crisp. It’s easy to use. Even a kid can operate it. Most wireless speakers are good because they’re packed with features. 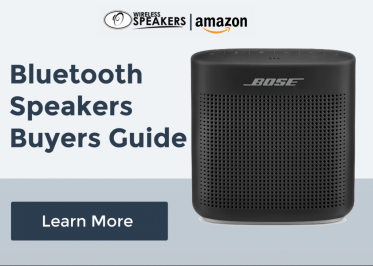 Some speakers offer functions and features that you can play with. Some will give you a spectacular audio quality that you will find desirable. Some will shock you with an unbelievable low price. But then, some Bluetooth speakers work with a few devices. How can a model with amazing simplicity make the list of the best Bluetooth speakers in its category? What would it be able to do that the others can’t? Now, we’ll be talking about one particular speaker, one with unbelievable simplicity: the Anker SoundCore mini, the super-portable Bluetooth speaker. Is it worth your entire month’s paycheck or simply a waste of money? Will it turn out to be a satisfying or will it end you frustrated. Let’s have a look. The central concept of this wireless speaker is minimalism. It’s an odd decision for a maker to go this direction because a lot of people want to wow the crowd by astonishing them with what a Bluetooth speaker can do. But that’s not the concept of this speaker. This simple speakers is perfect for travelling wherever you want. Anker chose a design that has a pure tone. It’s a round device that displays three simple buttons and made with a durable build. You can quickly put the speaker inside your car, and you’ll be confident that it sits in there securely and flawlessly. Its executive black finish signifies a universal appeal. It’s something that enhances the aura of your car – by fading tad noise in the background while enjoying your favorite songs. 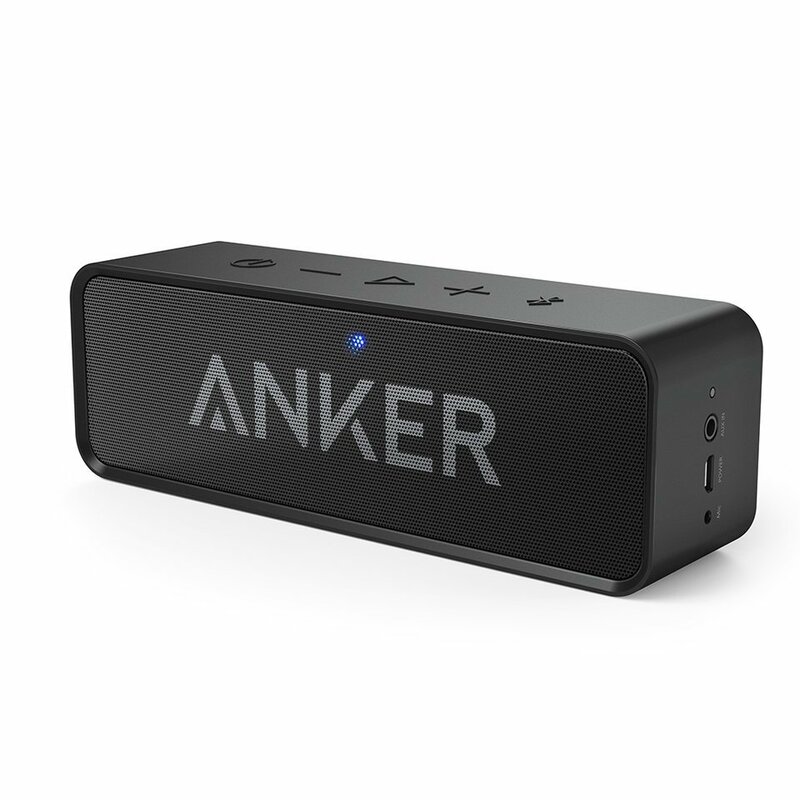 Anker penetrates the limelight by proving the masses of its superb sound, powered batteries, robust bass, and loud volume. The 5W audio driver and passive subwoofer make things possible. Anker claims that sound is still their strongest edge, and it’s worth your money. They’re proud to offer both of two worlds to their customers, the design that’s minimalistic and superb sound quality. Anker has an advanced technology integrated into its speakers. This speaker supports Micro SD, Bluetooth, AUX, and FM radio – users can freely choose how they want their songs played. The options are incredibly diverse. The Anker takes pride of its built-in battery that supplies 15 hours of non-stop play time. That’s too much for a single speaker, but it’s one of the best batteries in the market so far. Superb! Purchased two of these for a friend since I couldt get another small round speaker anymore. Listened to music the moment it arrived and fell in love with it – purchased myself one directly. The audio is fantastic, and I could not ask for more. When we think of quality speakers, expensive speakers will most likely be the first ones that come to mind. What most people forget though is that quality doesn’t necessarily mean that you’d need to shell out more money. The Anker SoundCore speaker can prove just that. They have built the Anker SoundCore speaker durable and robust. The speaker looks quite simple but not dull. Even the box that it comes with is simple in its design. Don’t let the simplicity trick you because this wireless speaker is sturdy. They have designed it to withstand outdoor conditions. They covered it with a rubberized plastic that gives it a feel of quality. The rubber coating also acts as a passive shock resistor. It’s a little heavy but is okay to carry around. There are switches that you can use for controlling and connecting, and they’re also very easy to find. This speaker is resistant to dust and moisture too. The sound quality of the Anker SoundCore speaker is admirable. Some people said that you could compare it with the Bose SoundLink speaker. Its sound is robust plus the bass is astonishing especially coming from a wireless speaker that size. This elegant speaker is covered it with a rubberized plastic that gives it a feel of quality. The lows are what you would expect from a small wireless speaker. Though, they sound clean and doesn’t look muddy. Its quality on the lows is just superb. The mids are nice and smooth. Though the details sometimes get lost, the sound is still there. And the vocals are as excellent as the instruments. The highs are a little harsh at high volume, but they’re tolerable. Anyone can easily solve this kind of problem though by lowering the amount of the volume. 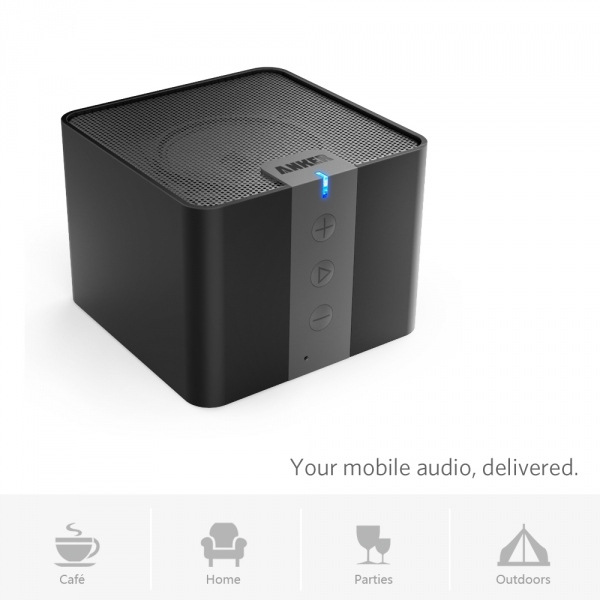 The Anker Soundcore speaker comes in a packaged box containing the Bluetooth speaker. You can find the user guide, the warranty card, and even the feedback form. The micro USB charging cable, plus the silicon wrist strap that’ll allow you to carry the speaker everywhere you go. They have made the box as simple as it can get. Try the Anker Soundcore speaker now, and experience quality without having to spend too much. Have a good speaker on the go while having extra dough on your hand. My friend said that I couldn’t go wrong with this wireless speaker, and he was right. I think I have made the right decision to follow his advice of trying this one out. I love this wireless speaker from the first time I’ve used it until now.